This week, our neighbours to the north welcomed a new era of government, when Justin Trudeau, the leader of the Liberal Party was sworn in as prime minister of Canada. And although his election marked the end of nearly a decade of conservatives ruling the country, it also marked a huge generational shift, as JT, at 43 years old, is the second youngest prime minister in Canada’s history. One of the major results of this is that for the first time ever, the cabinet is comprised of an equal number of men and women. With 15 men and 15 women, the ministers, mostly under the age of 50, represent a huge range of people, including two aboriginal members, three Sikh politicians, two atheists, a blind woman, a paralympic in a wheelchair… couldn’t make this up if I tried. This is great news for Canadians since there’s actually some semblance of what the population of the country looks like representing them in the government. My knowledge of JT’s existence only goes back to October when he was officially elected Prime Minister and I saw a pic of him legit clapped (outloud, to no one) to congratulate Canada as a whole. After his Drop The Mic moment on Wednesday’s swearing in ceremony, I needed to know more about him, and you do too. My fellow Americans (and rando other international friends), here is a primer to Prime Minister Trudeau. JT was born when his father, Pierre Trudeau, was serving as the 15th Prime Minister of Canada as part of the Liberal Party. Considered one of the greatest PMs of the country, Pierre was praised not only for his policies and effective reform throughout his 15 years in office, but for his charm and good looks. When he first was elected in 1968, Pierre helped reinvigorate the Liberal Party and Canadian government in general thanks to his youthfulness and breath of fresh air quality he brought to politics, and the term “Trudeaumania” even became a thing. 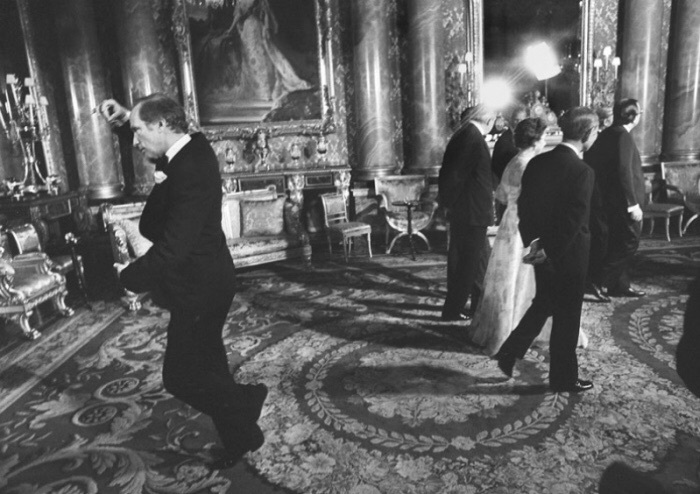 Exhibit B: Justin Trudeau dancing with his wife, Sophie, after being elected the new leader of the Liberal Party. A GIF that was posted on TWITTER that he described as GETTING THEIR GROOVE ON. 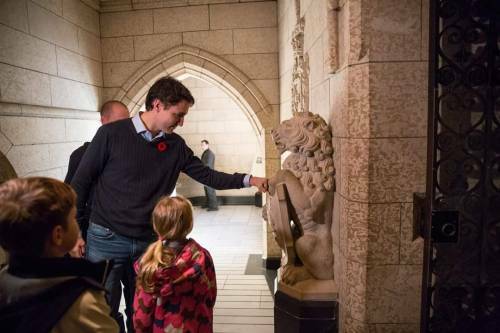 Justin is also the first child of a PM to become the head of government in Canada. Think of him as the George W. as opposed to the Jeb!. Growing up, Justin actually shied away from politics, and graduated with two degrees – one in literature and the other in education. He attended McGill University then the University of British Columbia, where he earned a degree in education. He became a teacher, educating Canada’s youth in French and math. I’m betting he was that teacher the girls secretly drew doodles about in their notebooks. It’s no Bedtime for Bonzo, but in 2007, JT starred in a two-part miniseries called The Great War, which detailed Canada’s participation in World War I. JT played Talbot Mercer Papineau, a Major who was killed during the Battle of Passchendaele in 1917. Also, he was a puppy lover. In 2012, JT showed off his athletic skills (and I guess his upper body as well) in a charity boxing match. He had difficulty finding an opponent until Conservative Senator Patrick Brazeau – that dude on the right – stepped up to the challenge. JT won in the third round and it was considered a major upset. Guess intimidation didn’t work on Justin. Speaking of shirts off, JT is believed to be the only global leader in modern times to have a tattoo. And his is obviously not a small white ink infinity sign on his pinky finger. No, JT has a huge tatt on his upper left arm, featuring the Earth inside a raven from the Haida tribe, the indigenous ethnic group the Trudeau family are honorary members of. JT is married to Canadian TV host Sophie Gregoire, and together they have three kids, Xavier James, 8, Ella-Grace Margaret, 6, and Hadrien, 1. 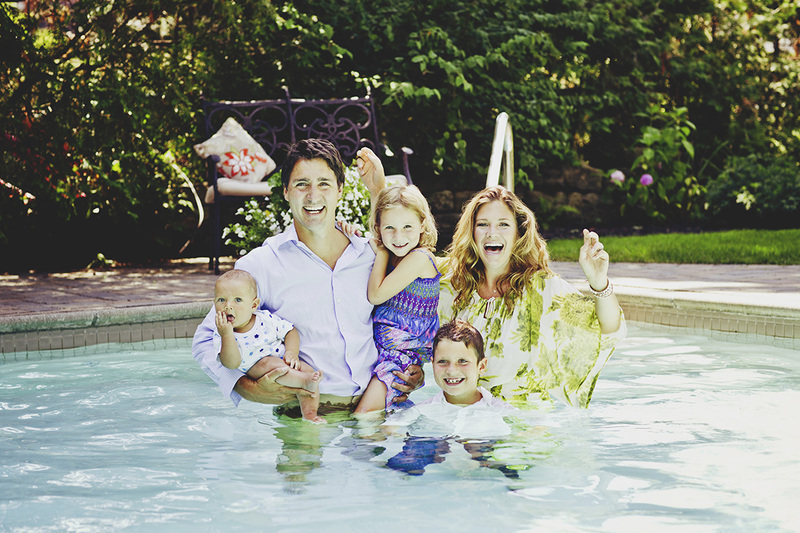 Why is the entire Trudeau family in their backyard swimming pool, you ask? Who knows? Who Cares! They’re adorable!